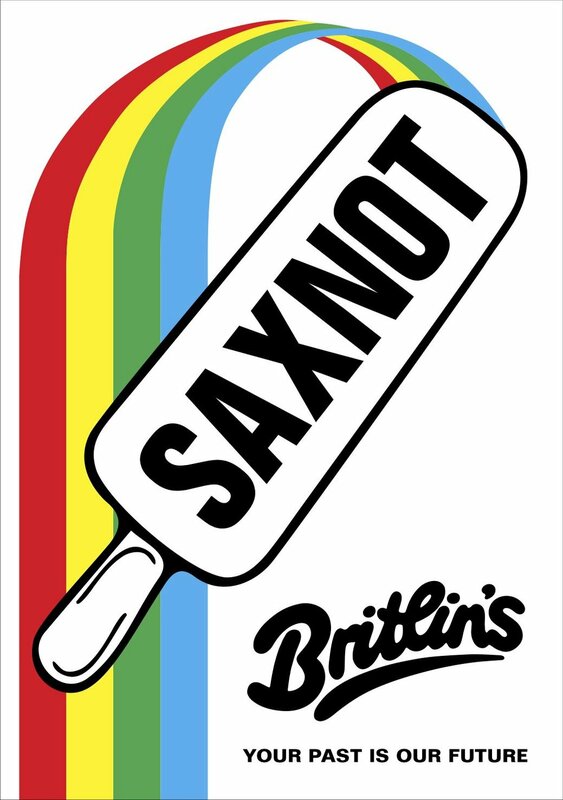 Welcome to Saxnot, artist and designer Scott King's fictional town inspired by British holiday camp Butlin's and our own tendency to idealise memories of 'how things used to be'. His designs, infographic works, printed leaflets and even food menus also hint at times of a darker edge: a 100-mile 'London Partition' echoing the infamous border wall that Trump made core to his campaign, a 'Fun Slide' emerging from a monolithic power station. It all suggests the ways in which seemingly harmless nostalgia for a past that may or may not have ever existed can be twisted into more aggressive and virulent strains of nationalism. We decided we would spend a day out in Saxnot to find out more, with Scott as our guide. Thanks for inviting us to Saxnot, Scott. What was it about the current social/political climate led you to create this town, drawing on the world of holiday camps from a bygone era? I have a long-running obsession with Butlins in the 1970s – I kind of chastise myself for it because it is pure nostalgia. 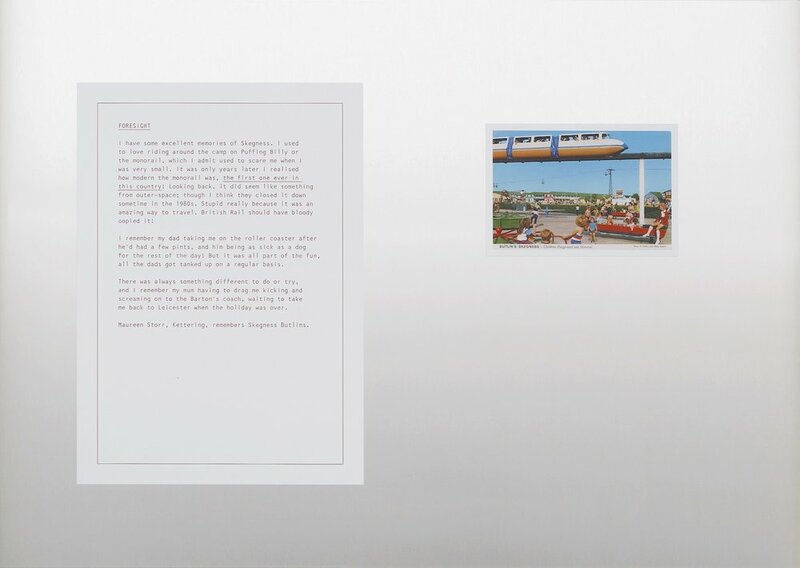 Over the last year or two, particularly with the EU referendum, it was impossible not to draw parallels between this nostalgic image of 1970s Butlins – a highly organised, pleasant, mono-society – and how 'pro-leave' politicians and campaigners sought to paint a vision of Britain: a Britain that was 'safe', where 'you knew your neighbour', where 'everyone mucked in'... these all being euphemisms of course for a much nastier subtext; so I began to imagine Britain redesigned as one gigantic 1970s Butlins camp. The Brexit referendum unleashed a particularly backward-looking strain of conservatism / nationalism. Are we already living in Saxnot? Or something close to it? I'm not sure that we already live in Saxnot, but there are a lot of people who seem to wish that we did. There are elements of Saxnot that are genuinely good; but it is such a simplistic image and depends so much on the exclusion of so many people and ideas, that once you scrape the surface, it is nothing more than soft fascism. So, what I'm really interested in is the nostalgia aspect – how nostalgia is used as a weapon of propaganda – how this imaginary 'Britain-past' has been conjured up and sold to a largely ageing generation of voters, in the hope that this place that never did exist could be willed into existence. Why do you think people are so often seduced by those marketing an idealised version of a past that never existed? I think we all are to a degree. Nostalgia is a social glue, and is not necessarily a bad thing in itself. But by definition nostalgia is hugely inaccurate, it has to be in order to work, that is it has to create a longing for some element of the past. If you think about the worst holiday you ever had, the most disastrous night out you ever had or the most embarrassing thing you ever did - there's a good chance that this will eventually pass into 'fond memory,' and if it's a memory that you share with your closest friends - if they were present when whatever happened happened - then it becomes the subject of shared laughter, it becomes sanitised, exaggerated and often repeated... so it glues you to a social group. It is something you share, and as time passed you all being to share the mythical rather than the actual version of events. I think this is exactly how an imagined 'Britain-past' was sold to a certain demographic of voters in the build up to Brexit. I went to Butlin's in Bognor a few times as a kid in the early 80s. I still have a big scar under my chin from an accident in the playground. Despite that, I remember having a good time. Do you have any personal memories of these holiday camps, pleasant or otherwise, that you drew on? Yes, I first went to Filey Butlin's with my family in 1977. My dad was completely resistant, I remember him sulking about it before we went – I clearly remember him trying to reason with my mum, 'It's only an hour from our house. Maybe I could come home after the first night then come back and see you most days?' He wanted to go salmon fishing in Scotland, and he hated the idea of 'joining in'. My mum is the opposite, she could organise a sing-along in a lift... so she was having none of it. She made him come with us. I remember insisting that my dad buy a T-shirt with an illustration of three drunken frogs on it, and beneath the illustration it said "Pissed Again!". My mum made him buy it and wear it. The poor sod. The second time I went to Filey Butlins – my dad didn't come, of course – we went with my mum's twin and her family, this was in 1983. Things had changed, I mean it was pretty grotty in 1977, but by 1983 it was kind of falling apart, lots of rides weren't working and our chalet leaked... but we still loved it. Sadly, 1983 turned out to be the last season of Filey Butlins, it closed in October of that year and was demolished in 1986. And I think this is where my fascination for it comes from – now, there is no trace of the camp whatsoever, a new-build estate stands on the site, so it only exists as a memory. And I find that very romantic... and really quite tragic. The 'London Partition’ echoes not just Trump’s proposed ‘wall’ but also the process of regeneration that is fast displacing working-class / immigrant communities in the capital. What are your thoughts on art and artists’ role in this process? The nature of urban regeneration dictates this, doesn't it... and artists always seem to be central to it. 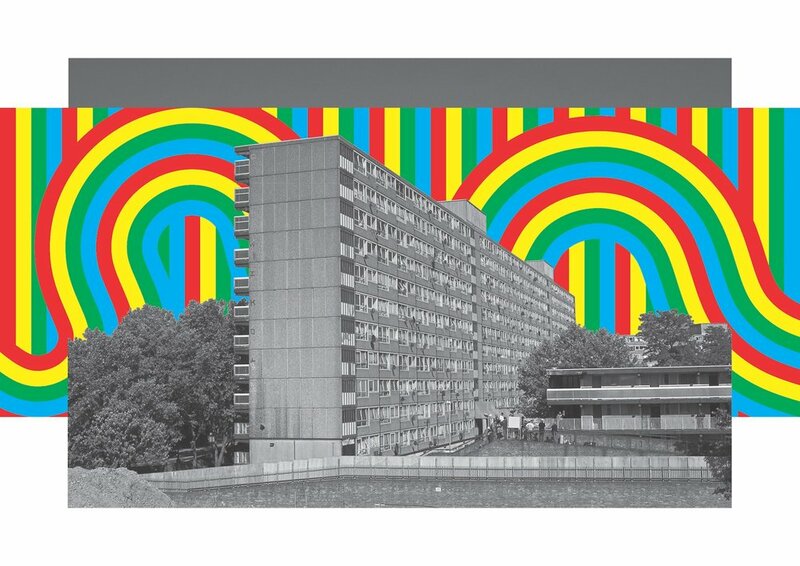 I think many artists are unwittingly the blitzkrieg storm-troopers of property developers – the most obvious London example is Hoxton and Shoreditch. In the 1980s and right into the early 90s, that whole part of what (used to be) east London was full of cheap warehouses, unwanted or disused spaces, so of course the artists moved in. Then, because the artists moved in, one or two of the pubs become 'cool', then someone opens a restaurant, then someone opens that clearest of all death knells: a deli. Once the deli has opened, the property developers swoop in, buy up the space, move most of the artists out and move the city workers in. You see this pattern being repeated all over London now, and I'm sure it's the same in other cities all over the world. You’ve worked across graphic design, publishing and advertising. How did you bring together your varied experience for the different aspects of this show? It's a hybrid of all these things, intentionally – I see it as a trade fair of sorts, a conceptual art trade fair. We’ve got quite hungry after our day out in Saxnot. What would you recommend from the menu? As you can see, there appears to be a lot of choice, but if you look closely, there isn't – this is true for every aspect of Britlin's. However, if you could skip across the prescribed daily menu – which you can't, but let's just say you can – I'd recommend the 'Oxtail Soup with Sherry' as a starter, the 'Roast Chicken, Parsley and Thyme Stuffing, Garden Peas, Baby Carrots, Roast and Boiled Potatoes' as a main. Then, for pudding – or 'sweet', as we say at Britlins – I'd go for the 'Gooseberry Crumble and Custard Sauce' – I love that expression, 'Custard Sauce'. This is a real menu copied exactly from Filey Butlins in 1978.